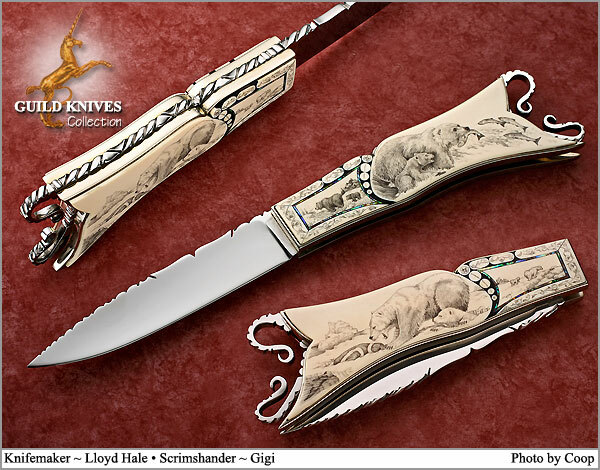 Lloyd Hale is considered by many as the father of the art knife movement. He was the first to turn utility hunting knives into works of art at gun shows, thereby greatly influencing the popularity of the decorative knife. Lloyd has over 100 knives on permanent display at the Louisville Museum. This depiction of mother bears teaching their cubs to hunt is superbly scrimshandered by Gigi (Georgia Sheehan). Bolster/Guard: 440-C with Elephant ivory inlay. Warranty: By maker for his lifetime.